The amendments to the Corporate Income Tax Act (CIT Act) were promulgated in State Gazette No. 94/30.11.2012. The amendments shall enter into force on 01.01.2013. Some of the most important changes in the CIT Act are summarized below. Following the legislative amendments there will be a major change in the manner in which the CIT advance instalments are determined. The main criterion for determining the type of CIT advance instalments will be the amount of the net sales for the previous year (under existing rules the type of the instalments depends on whether the person made a profit or a loss during the previous year). Further, the CIT advance instalments will be calculated based on the forecast tax profits for the current tax year. Persons whose net sales during the previous year did not exceed BGN 300 000 will be exempted from the obligation to calculate and pay advance instalments (prior to the amendments the threshold for advance instalments exemption was BGN 200 000). Nevertheless, the taxable persons may chose at their discretion to make quarterly advance instalments under the general rules. 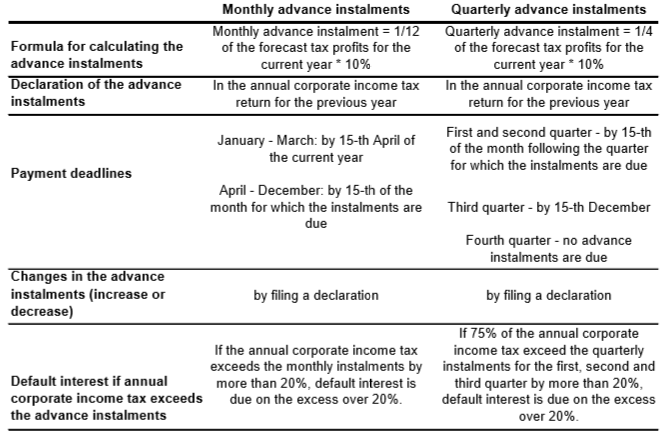 In this case, however, no default interest will be levied if the annual CIT exceeds the advance instalments. The monthly and quarterly CIT advance instalments for 2013 must be declared by the taxable persons in their annual CIT returns for 2012. On a separate note we should also mention that tax losses will no longer be deducted when determining the quarterly advance instalments. Following the changes the tax on expenses, which is currently due on a monthly basis, will be transformed into an annual tax. Thus, the taxable base of the tax will be formed by the expenses accrued for the respective tax year. The tax will be due by 31 March of the following year and any overpaid tax on expenses or CIT may be deducted from the tax on expenses for subsequent years. The time limits for payment of withholding tax (WHT) have been changed. So far the time limits ran from the beginning of the month following the month when the income was accrued and their duration depended on whether the beneficiary of the income was a tax resident in a state which is party to a Convention for the avoidance of the double taxation concluded with Bulgaria. Following the changes the WHT will be payable by the end of the month following the quarter during which the resolution for dividends distribution has been taken or, respectively, during which the income was accrued.